Fruit Fiesta is a three-reel progressive video slot game designed by Microgaming, which have the most revered reputation anywhere in the online casino software business. 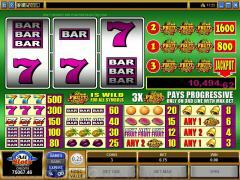 This is a game with three paylines, with a three-coin maximum bet. There is a fixed coin size of .25. Fruit Fiesta has a wild symbol, with Sevens, Bars, fruit and other symbols. Whatever symbols make up the winning combination, they have to line up on one of the designated paylines to win. This greatly resembles a traditional slot setup, so there is nothing about it that will make you not feel right at home. Fruit Fiesta does not have a scatter symbol, but does indeed have a wild symbol, which is naturally the Fruit Fiesta symbol. It is a "wild" for all symbols, which means that it can be used to complete any and all winning combinations. That is really the only twist in this game that is pretty basic, one would imagine intentionally so. Fruit Fiesta is a progressive slots game, which means that there is a jackpot that increases bit by bit as more players participate, and the jackpot, when it is won, comes from the entire pool of prize money that is accumulated. There is also one coin size in Fruit Fiesta, which is 0.25. There is a three-coin limit, and you must have the maximum bet out there at all times if you want to qualify to win the progressive jackpot. You can go right to the maximum bet at any time - just click the "Bet Max" button at the bottom of the interface. Every time you put another coin in, you enable another payline, up to three maximum. 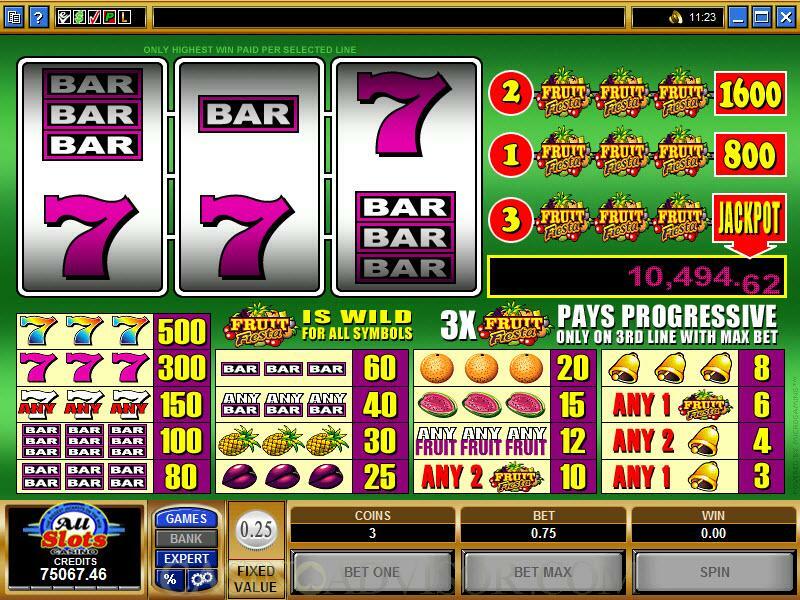 The progressive jackpot is achieved when you get the three wilds (Fruit Fiesta symbols) across the THIRD enabled payline, which is obviously why you have to have the maximum bet wagered. At that point, it pays the jackpot and starts all over again. Interested in reading more detailed information about Fruit Fiesta? If so Click Here for more details.